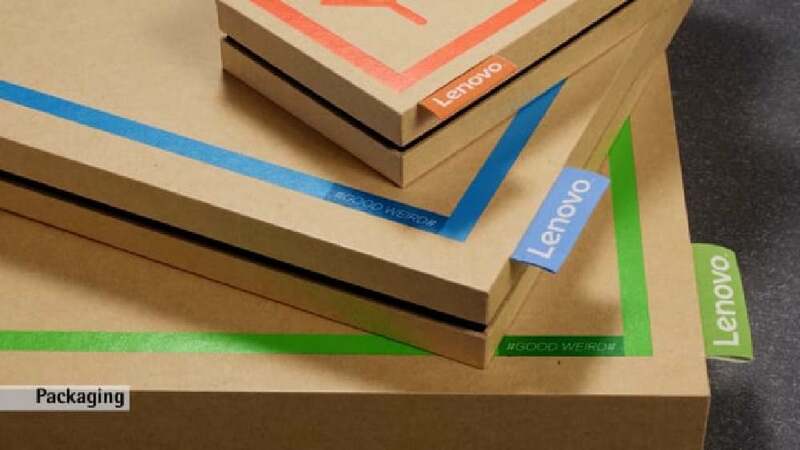 For the future Lenovo Yoga series, consisting of a smartphone, a tablet and a notebook, in both standard and premium product categories, a new family package design was created. Overall emphasis on the earth-tone paper material and sparse printing lend the design a simple and bold as well as intimate and authentic appeal. While the brown paper is used for the standard category to highlight its eco-friendliness, the darker soft paper is used for the premium category to highlight quality and high value. The Lenovo “tag” logo is a representation of the essence of the new Lenovo brand visual identity. The packaging was designed to be as thin as possible so that it is optimally space-saving, easy to transport and aesthetically contemporary. When opening the box, the lifting structure will slightly raise the product, making it look inviting and as if coming towards the user. Integrated into the fully stringent design concept, this detail adds a nice element of surprise. The packaging concept for the Lenovo Yoga series captivates with a spectacularly minimalistic and aesthetic graphic design. Thus, the set of different products shows a coherent overall appearance, complemented by a well thought-out material use and implementation. Furthermore, the beautiful single boxes are equipped with functional features that perform very well.